The first few nights we were in Los Angeles in June, Tawn and I stayed at the Travelodge Culver City on Washington Place just east of Sepulveda Drive. As down-market as you would expect a Travelodge to be, this one has received well-deserved high rankings in TripAdvisor and other review sites. 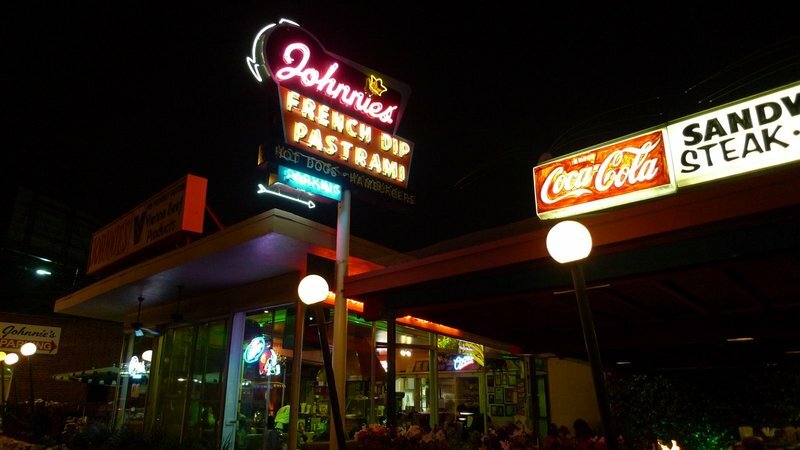 In addition to the really tasty Metro Cafe located downstairs from the motel, just around the corner was the timeless Johnnie’s French Dip Pastrami. Of course, I wanted to try it. Established in 1952, Johnnie’s is this small shack of a diner. 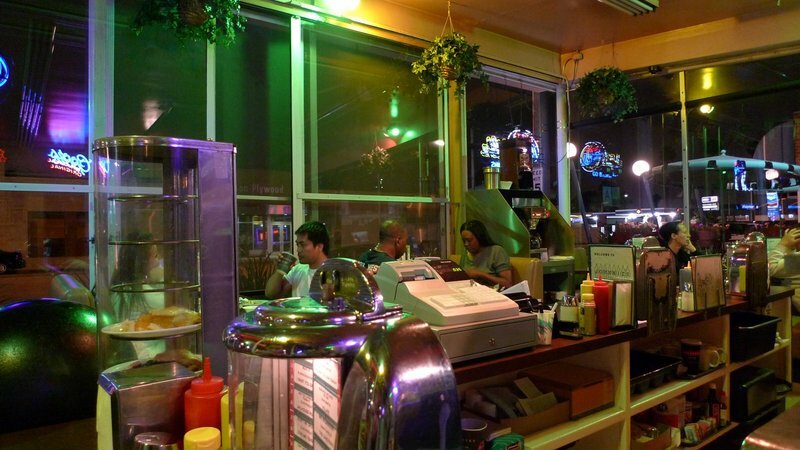 As their menu explains, the jukeboxes are originals and some of the waitresses are, too. The restaurant is open until 2:30 am and an hour later on Friday and Saturday nights. A wide mix of people stop by, young and old, well-off and those barely making ends meet. They all are there for one thing: good, honest food. The menu is simple: burgers, dogs, and sandwiches, with the pastrami taking center stage. 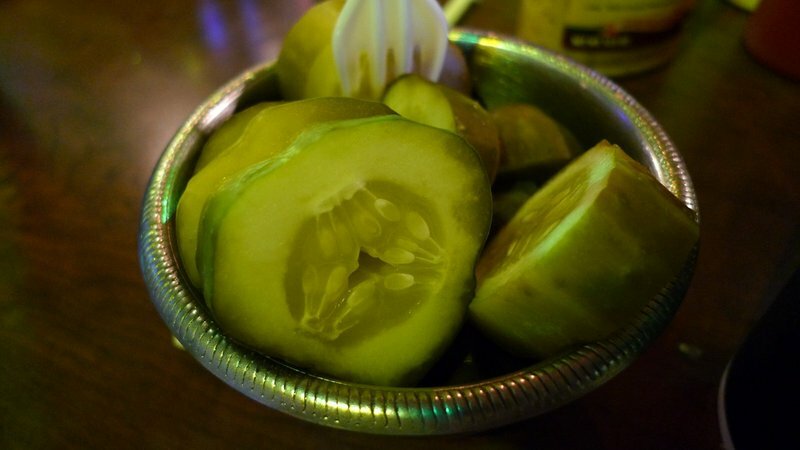 Complimentary dill pickles, sliced thick. Combine the pickles with a root beer float made with hand scooped ice cream and, despite it sounding like the food cravings of a pregnant woman, I was in heaven! The ambience is all chrome and naugahyde. The pastrami boils for a while then finishes in a steam bath, coming out moist and thinly sliced. What’s that machine on the left? Well, for you youngsters out there, that’s how a real milkshake is made! The pastrami on rye arrived. While pastrami is generally a fatty meat, I found my cuts to be quite rare. The fat that was attached was well-cooked and not overwhelming. Compare the construction of this sandwich to a pastrami I tried at a wanna-be place in Bangkok called New York Cheesecake, which served me only a thin layer of meat topped with a third slice of bread and several inches of lettuce and other veggies. Needless to say, Johnnie’s came a lot closer to satisfy my pastrami craving. As for the flavor, it was fantastic. Tawn ordered a veggie burger. What’s that!? 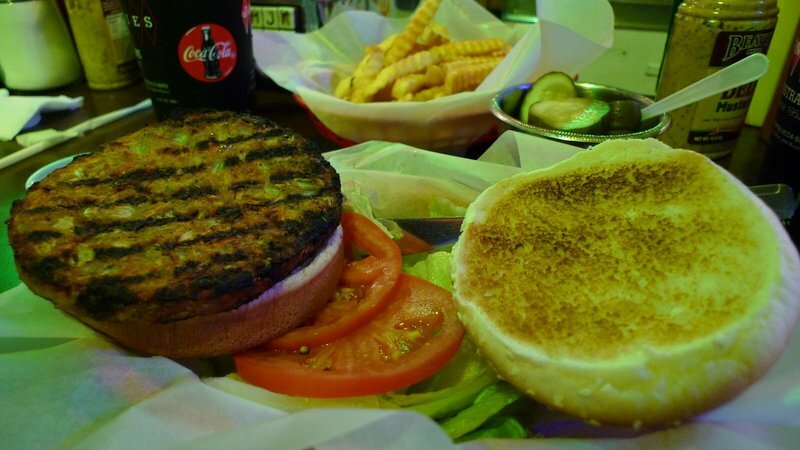 A veggie burger at a place like Johnnie’s!? Well, as my dearly departed paternal grandmother used to say, if we all liked the same things the world would sure be a boring place. Truth be told, it was a pretty tasty veggie burger probably thanks to all the burnt-on beef bits on the grill! Overall, we could debate whether Johnnie’s has the best pastrami in LA or not. People have different preferences, of course. 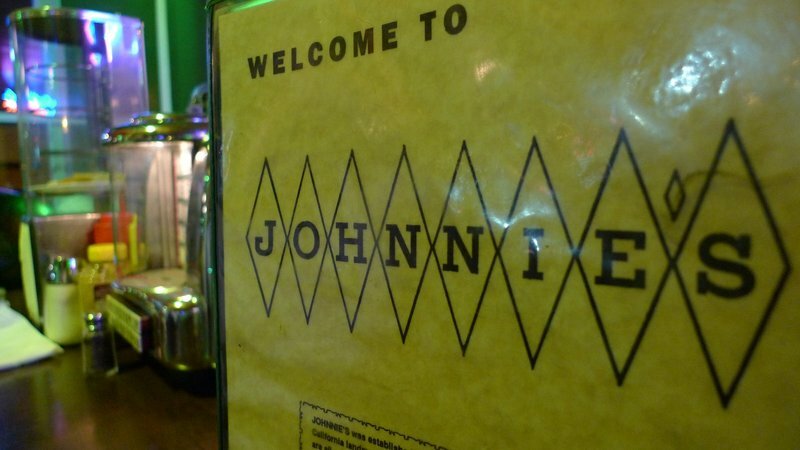 I just know that Johnnie’s hit the spot for me, filling a need for good pastrami that I had been carrying with me for many months. Next time I’m back in LA, I may return. Or I may seek out some of the other recommended pastrami shops. We’ll see. This entry was posted in Uncategorized and tagged California, City, Classic, Culver, deli, Diner, Dining, food, Grill, Johnnie, Johnnie's, LA, Los Angeles, pastrami, Restaurant, Sandwich, Sepulveda by christao408. Bookmark the permalink. oh man, oh man… i wanna get my hands on that pastrami on rye. N some of that root beer float to gulp it all down. YUM. Pastrami on rye is a favorite if it is made properly. Yours seemed to be done well!! The root beer float take me back to my grade school days – that was a reward for a good report from school! The pastrami sandwich is almost as tall as the ones from a Jewish deli in NY or Chicago. (If you’re ever in Chicago and have a taste for corned beef or pastrami, try Manny’s (http://www.mannysdeli.com/) the best! I love all the caraway in the rye bread. And I want a root beer float right now. Tawn’s veggie burger? UGH! I’ll take this food over that sophisticated meal you had the other day. Where it was all looks and no real substance. Wow — that looks like a wonderful satisfaction for a craving! I seldom get up that way for a meal any longer, but that looks intriguing! Haha, love the burnt-on beef bits! I like that float and will certainly stop by in the future! I need to have that float. I love pastrami on rye with swiss cheese. Yummm. My dad was a soda jerk in high school. He used to drag us to places that had working soda fountains… now it is a rarity! Glad your cravings have been satisfied! i am sure it was good and it looks like it, but the next time you are in the la area, you should go to “the hat” there are several in the metro la area, if you want a pastrami sandwich! @buddy71 – Thanks for the suggestion. While reading the reviews on Yelp, I noticed many people reference The Hat along with one other place in town. 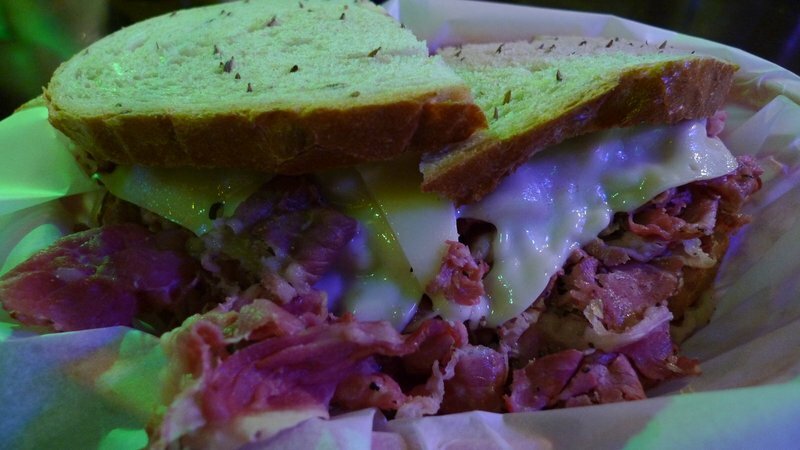 No doubt there are many contenders for the best pastrami. I was just glad to try a place that was light years ahead of what I can find here in Thailand! 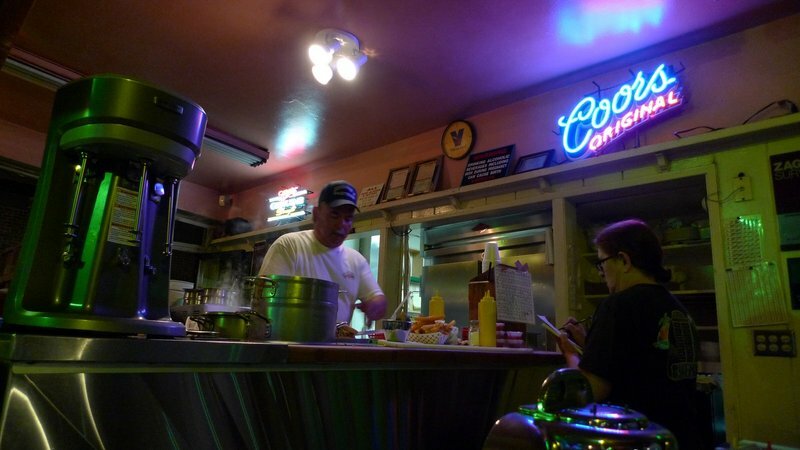 =D@murisopsis – Okay, we aren’t connected via facebook, but I posted an article from the NY Times a couple of days ago about a few folks who are bringing soda jerks and lunch counters back into vogue, making their own syrups and sauces, etc. I would love to visit some of them. Article here. @AppsScraps – In complete agreement with you. @Sinful_Sundae – Do go! 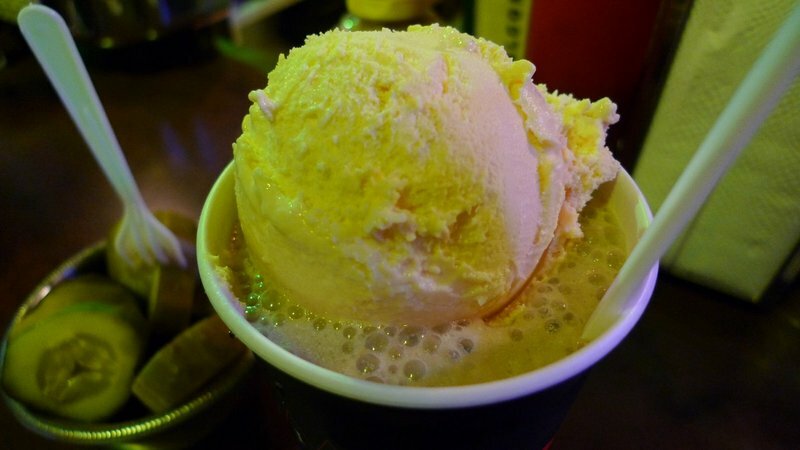 @ZSA_MD – @CurryPuffy – @Fatcat723 – @rudyhou – The root beer float was every bit as good as you might imagine. @yang1815 – Shhh! Don’t tell Tawn. He thinks they have a special “veggie burger only” grill. @The_Eyes_Of_A_Painter – I totally get your point. One observation, though, is that with a meal like this one, it is largely a “one note wonder” and that’s why we end up eating humongous portions. No way to feel satisfied otherwise. @Passionflwr86 – Compliment taken. Thanks. @slmret – Might be worth a stop…@Jewelbeetle – Thanks for that suggestion. Chicago is on the list of cities we need to get back to. Either pastrami sandwich would suit me fine. Pickles and root beer float? I suppose every foodie has some flaws…. hahaha. @christine24666 – Oh, I don’t know that I would describe myself as a success by any stretch of the imagination. Two things to remember that affect your perception of me: First, my blog entries tend to distort time and emphasize only the fun and interesting things in my life. For example, I was in LA for two weeks but the posts have stretched out over a month, making it seem like I’m traveling more than I am.Second, I’m in a “double income, no kids” relationship and live somewhere with low cost of living, so that gives me a little more disposable income than, say, a college student in the US. This also serves to make things look a little more “fabulous” than they really are.So, all that said, I think you have to take what you see on my blog with a grain of salt. I’m honest, but also selective. Now as for advice, if I was giving advice to me some twenty years ago in college, I would say two things: Avoid debt like the plague, especially credit card debt. When you are just starting out, you don’t want to waste any of your hard-earned money paying interest to a bank.Live beneath your means. Not “within” you means – “beneath” them. You will have much more disposable income for things like travel or whatever else you enjoy, if in your day-to-day life you decide that you can live in a smaller home, with a smaller (or no) car, without the latest fashions, etc.That’s my response to your questions. Thanks for commenting! @christao408 – Cool thank you!